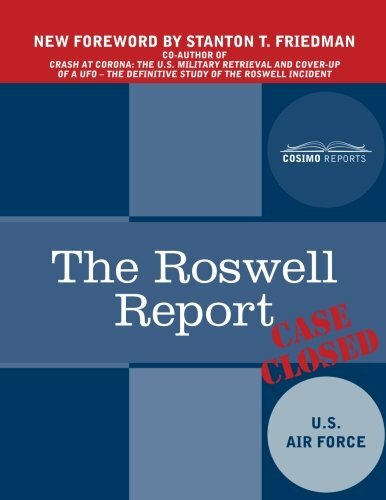 The Roswell Report: Case Closed is the second of two reports published by the United States Air Force to explain the events of the Roswell Incident that occurred in July of 1947. A follow-up to the report Fact Versus Fiction in the New Mexico Desert, Case Closed includes further analysis and discussion of the events. The Foreword explains, "Our objective throughout this inquiry has been simple and consistent: to find all the facts and bring them to light. If documents were classified, declassify them; where they were dispersed, bring them into a single source for public review." This report, published in 1997, includes a brand new Introduction from UFO expert and writer Stanton L. Friedman. The U.S. AIR FORCE is the aviation branch of the United States military. The headquarters of this branch authorized several research projects on the origin and existence of UFOs and published multiple reports of their findings from the 1950s through the 1980s. It is still the subject of speculation today whether the U.S. Air Force is responsible for a large-scale cover-up of UFO and extraterrestrial evidence.